Unlike all the other regions of Italy, landlocked Umbria has no coastline or common border with another country. Central Umbria is roughly 110 miles from the Tyrrhenian Sea to the west, and about the same distance from the Adriatic to the east. While the fabled cities of the Amalfi Coast, Venice, Portofino and other seaside charmers draw the most tourists, the modern and historic cities of Umbria are relatively low-key with a quieter charm all their own and, for many, represent the essence of a holiday in Italy. Roman, medieval and renaissance landmarks abound in practically every city in Umbria. Assisi, birthplace of Saints Francis and Gabriel, is a standout. The Basilica of St. Francis of Assisi, a World Heritage Site since 2000, is regarded as one of the most important Christian pilgrimage sites in Italy. In addition, the range and quality of artwork housed there – including frescoes and other works by Giotto, Cimabue, Simone, Martini and Pietro Lorenzetti – makes it uniquely important in Italian art history. Each town in the region has a claim to fame of some sort Norcia, the hometown of St. Benedict, is renown for its hams, sausages and black truffles. Spoleto is the site of the Festival dei Due Mondi, an important three-week cultural event held in late June/early July featuring music, theater and dance performances by artists from around the world. The hilltop town of Montefalco, and the valley below, is all about olive groves, vineyards, and delicious Sagrantino, Passito and Secco wines. The tratorrias, restaurants and pizzerias throughout Umbria are phenomenal with the widest selection in Perugia, the regional capital. You can learn to prepare Umbrian specialties and sharpen your culinary skills with cooking lessons at the prestigious Peruygia Cordon Bleu Academy. Right in the middle of the food, wine, history, and natural beauty of Umbria is the town of Todi, perched on a two-crested hill overlooking the east bank of the Tiber River. 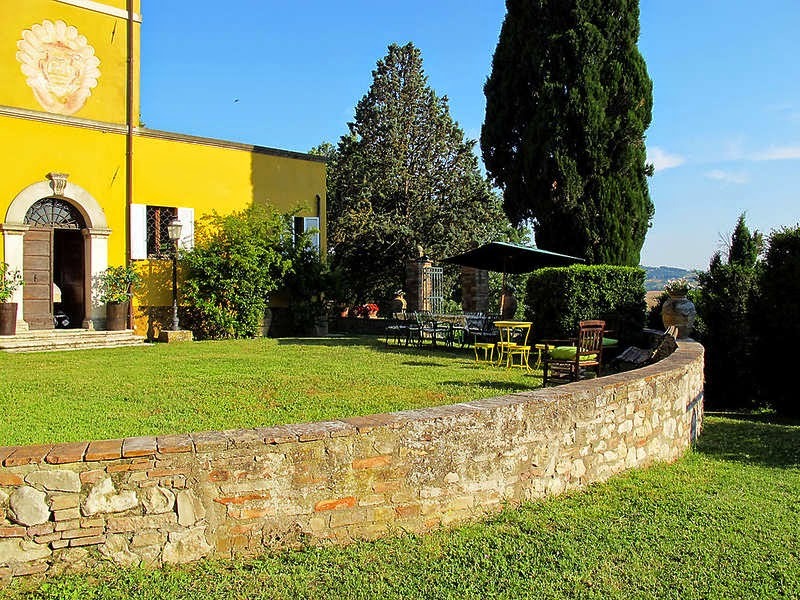 Todi has many historical castles, fortresses and ancient churches, but what makes it really special are the three International Vacation Home Exchange properties located here. For your inland Italian holiday, you can choose from an Umbrian villa, a boutique hotel, or an historic 17th Century mansion. 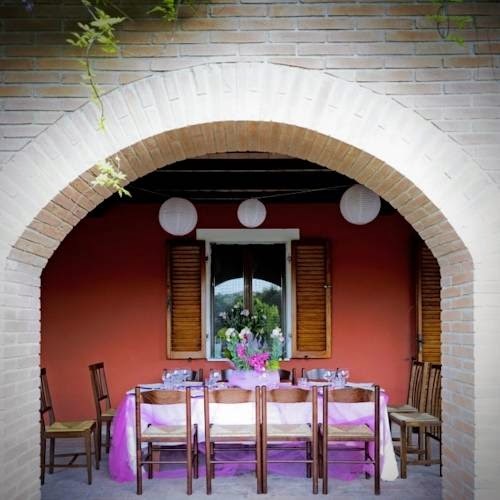 You enter this dramatic villa through a large arched brick porch where you can also dine al fresco. The lounge, with a big open fireplace, and the spacious kitchen are on the ground floor. The bedrooms, bathrooms, and a lovely glazed sun room are on the first floor. There is a pool and patio area with a large brick barbecue grill at the rear of the house. 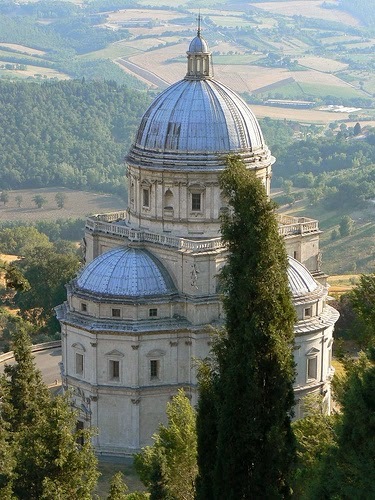 The crafts shops, antique stores, restaurants and attractions of Todi are just five km away. Home Swap #0841 – Boutique hotel in the brian wine country. Nestled in green rolling hills and surrounded by vineyards, Villa Sobreano is the quintessential Umbrian country house. Built in the 1800s, but renovated with every modern convenience, the villa is divided into four double rooms and two suites, each with its own private bath and sitting room. There is a lovely garden with a swimming pool and barbecue facilities for relaxing in the warm Italian sun. The lower section of the villa gives you access to a long gallery that houses ancient oak barrels used for storing and aging wine. The gallery leads to wine cellars beneath the villa where you can taste the wines produced on the Villa Sobrano estate. A breakfast with homemade baked goods and sweets is offered daily. Savoury dishes are available on request. Delicious options for dining out are available in Todi, seven km away. Villa Broglino is a 17th Century mansion that belonged in the same family until 1900. It has been carefully restored, preserving its original architecture and charm The kitchen is fully-equipped. There is TV, internet and Wi-Fi connections. The grounds of the Villa resemble a large park and slope down to an shady olive grove. A wonderful swimming pool and solarium complete the relaxation picture. The restaurants, shops, and historical sights of Todi are a five-minute drive away. If you own a second home or a vacation-rental property anywhere in the world, the International Vacation Home Exchange can help you maximize its usage, plus give you a world of home exchange choices for your own vacation, through a home-swap system based on credits rather than simultaneous trade exchanges. Find out more about it, and what membership can mean to you, at www.ivhe.com. For members wanting more details on these “molta bella” properties in Umbria, Italy, click on the property numbers above. If you are new to house swaps, this guide is a great introduction. For those of you that are experienced traders, it will give you new ideas to consider to enhance your home exchanging. Either way, its Free, Get your Home Exchange Guide now. There are five lodges in the Marloth Kruger group. They vary by size depending on the number of guests that can be accommodated.is a little deeper into the surrounding bush and delightfully closer to Mother Nature than the others lodges. You can sit out on a spacious veranda and enjoy it while dining or watching the sun go down. Cookouts are especially fun. You have a barbecue boma furnished with comfortable outdoor furniture. For indoor dining, the kitchen is fully-equipped and the dining table seats six﻿﻿.﻿﻿nuggled next to the Kruger National Park like a lion cub to its mother, Marloth Park is a private wildlife reserve in Mpumalanga, South Africa, offering practically the same viewing of African animals as Kruger but from a cozy, comfortable vantage point. The Marloth Kruger Lodges here are roofed with traditional thatch, fully-equipped with all the comforts of home, and all are vacation home exchange accommodations. on-predatory animals roam the Lodge grounds in a beautiful, tranquil setting. While you’re having breakfast on your veranda, a zebra or a curious monkey may pop up to bid you “good morning.” At Marloth Park, you don't have to go looking for the animals, they will come to you For a look at some wilder wildlife, take a five minute drive to the Kruger Park lookout and see hippo, rhino, elephant, water bucks, buffalo, giraffe and other animals. For a more up front and personal encounter, plan an unforgettable excursion or safari inside the park. The entrance at Crocodile Bridge Gate is just 16 kms away. The two bedrooms are spacious and cozy. Each has its own en-suite bathroom. The queen-size beds are draped by canopied muslin mosquito nets for a feel of luxury and intimacy. The lodge has ceiling fans and air conditioning for just the right temps. A DVD player and television are there in case you need an electronics fix. 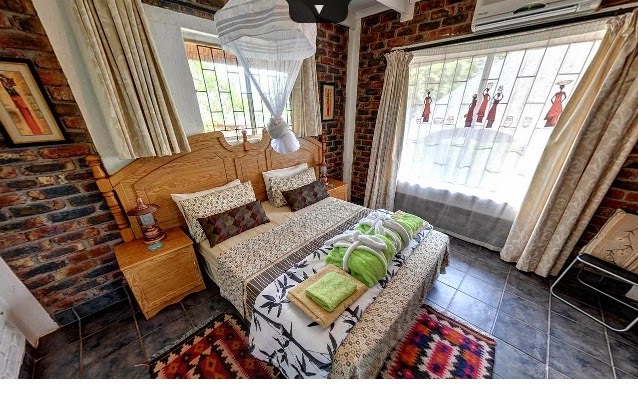 GiraffeLodge home swap is decorated in African Bush motifs with touches of Modern to make for a warm, welcoming feel. Each of the two bedrooms has a separate shower and bath. Mosquito nets hang over every bed, ready to drop into a romantic canopy at night. The living/dining area is open and airy. You have a barbeque boma and fire pit as well as a modern kitchen with fridge, stove, microwave, and all the cooking utensils and tableware you need. There is a separate children’s boma and a large garden in front of the lodges. Kudo Lodge house for exchange is named after the most handsome of African antelopes. Its African-Colonial style décor and furnishings reflect the graceful character of its namesake. A spacious veranda and wooden deck, ideal for al-fresco dining, includes a splash pool for a refreshing dip after a day of game watching. For cookouts, you have a thatched braai and fire pit. This lodge shares the surrounding forest with an enormous variety of birds. 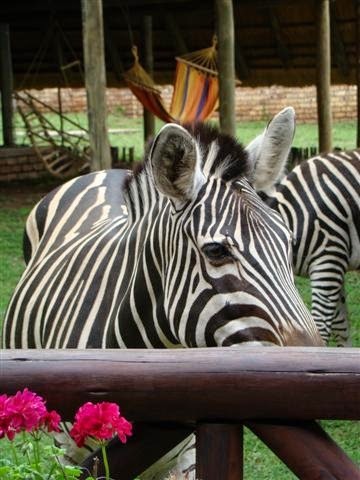 Occasionally, from out of the forest shade, a zebra, warthog or buck may emerge and drop by for a visit. showers and baths. Mosquito nets hang over each bed, ready for draping at bedtime. The lodge is cooled with air conditioning and ceiling fans. You can prepare your favorite meals in a ready-when-you-are kitchen, or do the South African cookout at the braai (barbeque) boma and fire pit; a glass of good South African wine to top it off – heaven in the bush. Big 5 Lodge is a three-storied affair designed for comfortable, spacious outdoor living. The first floor houses a kitchen and dining area that opens onto a large verandah. 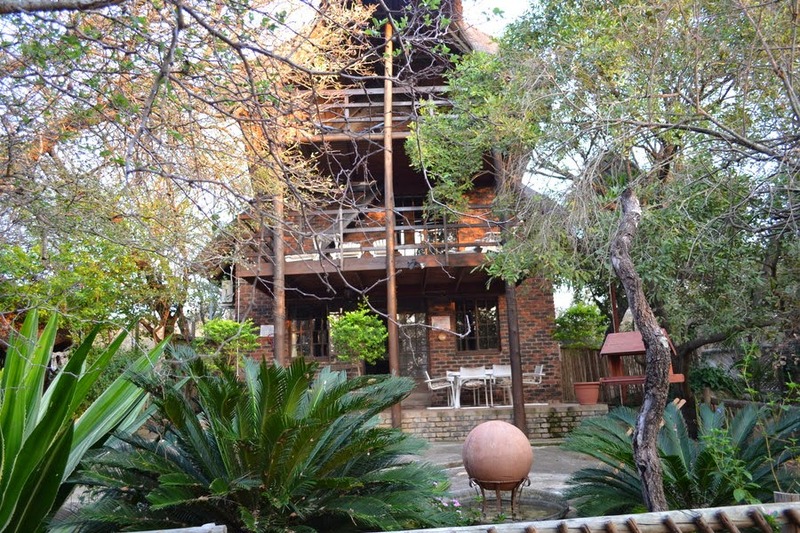 The air-conditioned living area and TV lounge upstairs opens onto a deck with a view of Kruger Park. The third level is a viewing deck where you get a bird’s eye view of the Park. Lions and elephants have been sighted from here. Big 5 Lodge has four bedrooms, an en-suite bathroom, and two additional bathrooms with shower, bath, toilet and washbasin. In the evening, when the African sky sparkles with countless stars, you can relax on the veranda, the viewing decks, or at the barbecue grill (braai) and safely listen to lions roaring in the distance. Adventure in style. The International Vacation Home Exchange offers a variety of properties in South Africa – luxury homes on the amazing coast, in the sophisticated wine country and in dynamic cities. Visit www.ivhe.com and do a property search under South Africa. While you’re on site, check out WHO WE ARE and HOW IT WORKS for more information about our unique vacation-home-exchange system. Alaska – the last frontier, the land of the midnight sun, a vacation destination unlike no other. 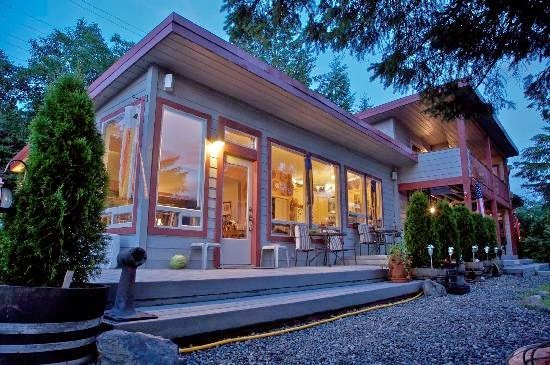 IVHE offers a variety of luxuryhome exchanges and ways to experience the wonders of Alaska from Ketchikan to Anchorage. .
IVHE offers some amazing accommodations in Ketchikan, the Alaskan city closest to the Lower 48. 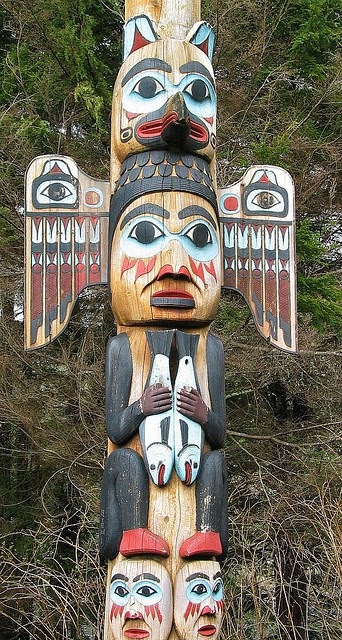 This friendly town of 15,000 sits on one of the larger islands in the Inside Passage archipelago of 1,100 islands. Most of the islands are part of a huge national forest that contains The Misty Fjords National Monument, a wilderness area so remote that most visitors see it from cruise ships, private boats, or kayaks… which brings us to our first accommodation – a yacht you can think of as your private floating lodge, one that will take you through the Misty Fjords wilderness areas in comfort and style. Our next property is a lodge, indeed, stationery on the waterfront of Ketchikan. It’s the Black Bear Inn with IVHE accommodations available three different ways: as a bed and breakfast, as a luxury apartment, or as a romantic bunkhouse cabin. 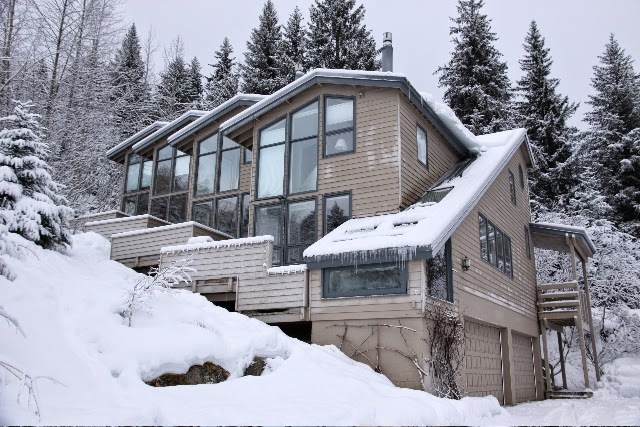 Moving inland to Fairbanks, the IVHE property here is a modern house in the woods. These woods are not to be confused with the pristine wilderness of the Danali National Park and Preserve, two hours away. Danali is the largest national park in the U.S. –more than six million acres. Its centerpiece is the highest mountain in North America, Mount McKinley, with an elevation of 20,237 feet (6,168 m). Finally, Anchorage, the state’s largest city, enters the IVHE picture by way of Girdwood Alaska and a mountainside condo at the Alyeska Ski Resort, about 27 miles from the big city. The Alyeska Resort is the largest ski area in the state, with the majority of the runs made to challenge intermediate and advanced skiers. The highest point on Mount Alyeska accessible by chair lift is 2,750 feet (840 m). Apres ski in Anchorage means fine dining, theater and an excellent music scene. 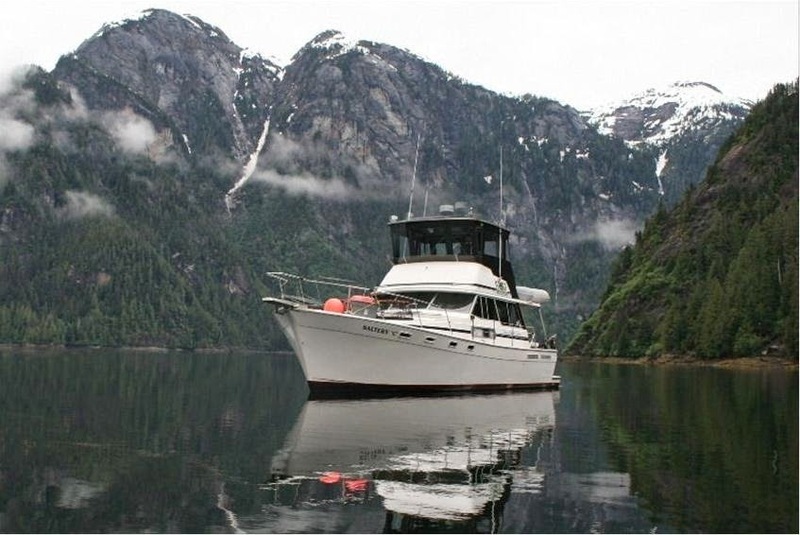 A 40-ft. motoryacht cruising Misty Fiords National Monument for five days. You will move from spectacular place to spectacular place aboard your own private floating lodge. Fish for salmon or halibut in salt water, or go freshwater fly and spin fishing for salmon and trout (all tackle is included); look for orcas, sea lions, and porpoises in the water; eagles in the air; and bears and mountain goats on the land. Go ashore at beautiful landings and hike and explore with an experienced Guide. All meals are provided. At night, your captain anchors the boat in a secluded cove where you’ll bunk down in cozy comfort. This could be the vacation of a lifetime. All rooms in this elegant B&B have stunning views of the Tongass Narrows, a channel of Alaska’s Inside Passage waterway used by recreational and commercial vessels from Kayaks to freight barges. Each room has a private bath, unique furnishings, and nice amenities. Wireless internet is available. A self-serve Continental Plus breakfast and snacks are included. Waterfront restaurants are a five-minute walk away. More eateries, cafes, and bars are four miles away in downtown Ketchikan, as are many shopping opportunities and cultural attractions. 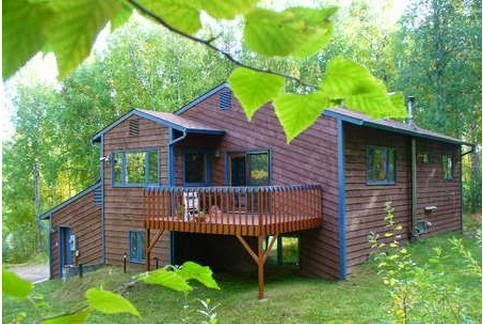 The Inn is ideal for short stays when going to or returning from other Alaska adventures. Or, it can be a destination in itself with plenty to do in the area. Arrival and departure transportation is provided. Not only does this private luxury suite have spectacular views of the mountains, ocean and sunsets, but you can also look out your window and see Bald Eagles perching in the spruce trees nearby – thus the name. The Eagles Nest has its own private entrance and covered porch at the front of the Inn. The suite features the artwork of Fred Machetanz, Sidney Laurence and Nathalie Parenteau. The kitchen, bathroom, laundry room and the front foyer are adorned with decorative Italian porcelain and travertine. For a location usually associated with “roughing it,” this suite has delightfully unexpected class and style. The Bunkhouse is a very private cabin that sits beside the main house. 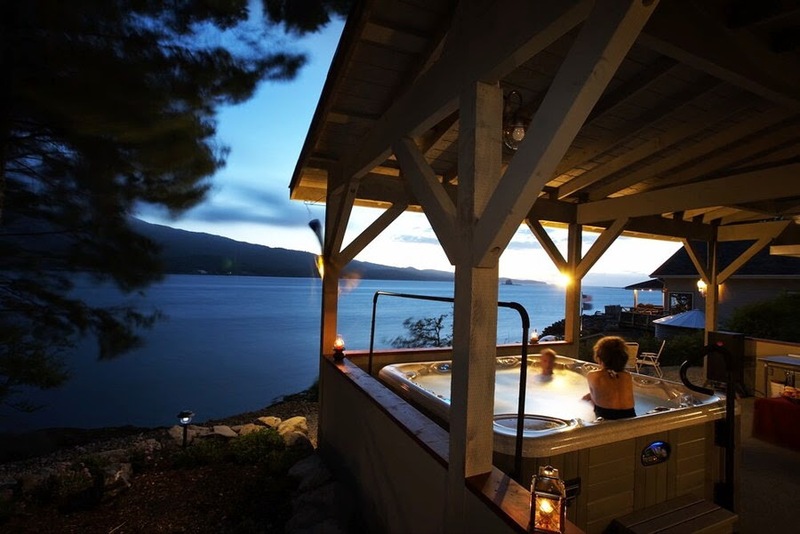 An open sun deck, with a relaxing hot tub, runs across the front of the cabin with an awesome view of the Inside Passage. There are large picture windows inside, also with views of the water. The walls of the cabin are finished in white-washed red cedar. The floors are porcelain, slate, and travertine. A walk-in shower in the bathroom is also done in travertine. There is a small kitchenette, fully equipped, for whipping up a quick meal. You would never know that this cabin is over 73 years old and was once part of a fish cannery camp. It was modernized and opened to guests in 2007. 2-bedroom mountainside condo; ski in and ski out. This cozy 1000 square-foot condo is in a friendly 4-unit complex close to resort amenities. The closest chairlift is a two-minute ski from the condo. A year ‘round tram that can take you 2300 feet vertical in seven minutes is in easy walking distance, as is the town of Girdwood. You have amazing views of the resort and several hanging glaciers in the Girdwood Valley from your living room and master bedroom. A summer visit is worth considering as well. The landscape is green instead of white. Cross country ski trails become simple hiking trails lined with wild flowers, and the fine restaurants, museums, theaters and nightlife of Anchorage beckons even stronger. For more information on any of these Alaska home exchanges, click the property # above. If you are not a member of the International Vacation Home Exchange and would like to learn more, visit www.ivhe.com to see who we are and how our system of credits-based exchanges can work for you and your vacation property. Are All Home Exchanges the Same? Why don't you stay at my home while I stay at yours? 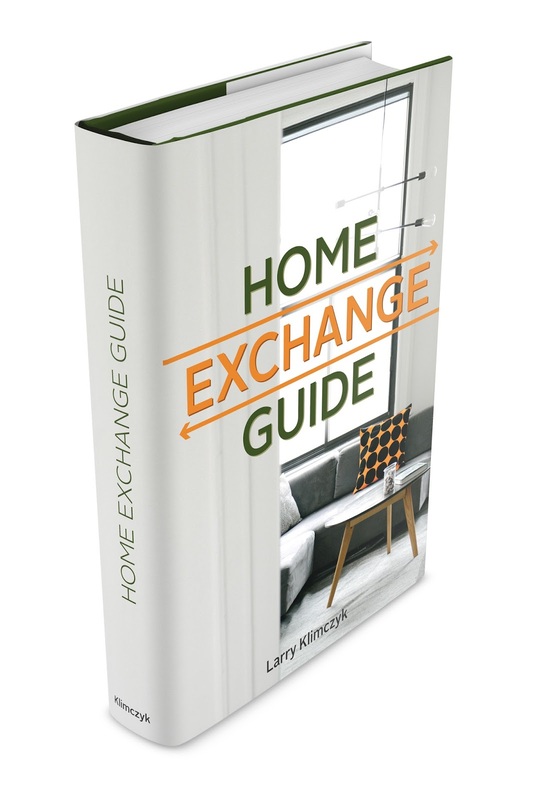 For us, this is the most straightforward description of home exchange but did you know that there are different types of home exchange? Popular theory is that home exchanging started in Europe back in the 1950's between teachers looking to experience something new and different during their long summer breaks. Good news is that today, we can still enjoy home exchanging for adventure and a lot more but we also have a much easier way of finding others to exchange with, the internet. Today it is not just teachers benefiting from home exchange, but people from all walks of life. Before looking at how to choose an exchange that is right for you, let’s take a look at differing types of exchanges. The three most popular types of exchanging are Direct, Non-Simultaneous, and Hospitality exchanges. Let’s explore each of them as you might find one or more perfect for you. Depending on where you are in the world you might call an exchange a swap or a trade. We will intermingle these terms as they essentially mean the same. Direct Exchanges - the most commonly known, this is when two parties agree to swap locations for the same period of time. Advantage: Straight forward, with no accommodation costs this saves the most money. Disadvantage: Two parties have to like each other's properties and locations as well as agree the exact same time for swapping. Hospitality Exchange - when one party hosts another in their home while they are there too. The gesture is then reciprocated at a later time. live like a local Limited to no accommodation costs for your vacation . Potential of avoiding bike, car, boat, and sporting equipment rental costs. Non-Simultaneous Exchanges - when the two parties schedule their vacations at different times. This is most popular when using second or vacation homes, though it is possible to use the primary home if the owners are traveling. Advantage: When using a property that is not the main residence, there is a lot more flexibility of when the exchanges can occur. When using an exchange network like IVHE-Vacation Home Exchange with mostly second homes, a credit system can be established to account for differing values of properties, and time of visits. Disadvantage: Anxiety of not trading at the same time. Overcome by using an established network with an equitable credit system. Advantage: Not only to you get to visit a location, but you might get a 'personal guide' while making new friends. Disadvantage: Not everyone wants to spend vacation time with another family that they have never met. Though when the return trip is made, the parties should know each other pretty well. In our experience, the most important of all is HAVING FUN, enjoy! Have a look at some amazing properties that home exchange could take you have a look at ivhe's exclusive home exchange property pages.